Help The Arc fulfill the wishes of clients in need with Gift Cards for everyday essentials like groceries, a warm blanket or clothes for work. People with developmental disabilities are often alone or without the means to celebrate the holidays. Your gift of $25 or more will purchase a gift card to Walgreens, Safeway or Target, bringing joy and a welcome gift to someone in need. Gift Cards are in $25 increments. But most clients need multiple gift cards. 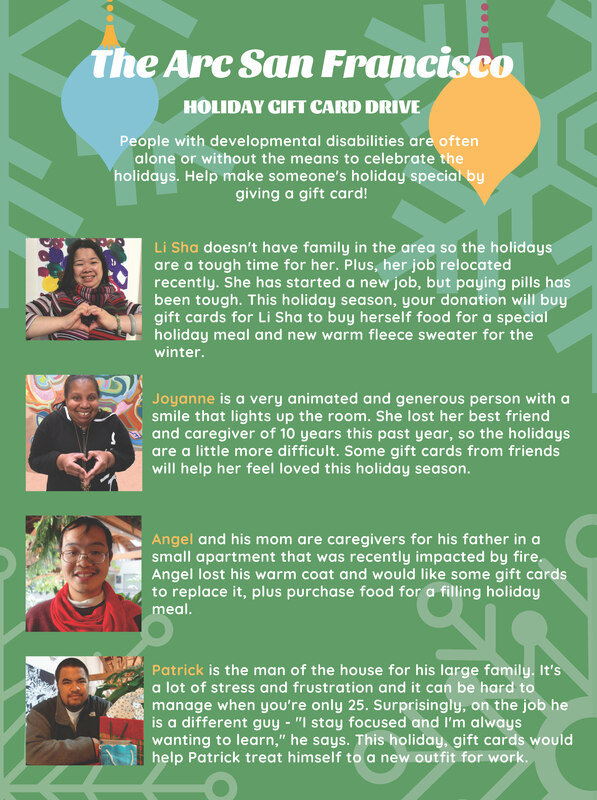 Email aguillen@thearcsf.org to indicate how many of which Gift Cards you/your office would like to purchase ($25 ea. : Safeway, Target and/or Walgreens), with the amount you wish to raise, or the amount of your one-time cash donation.  In past years, generous companies have “adopted” a group of Arc clients. We provide brief biographies of each client and then their stories are circulated among employees, inviting them to support the cause. We'll be launching this year's Holiday Gift Card Drive on #GivingTuesday, November 27th. But you can jumpstart your company's campaign now--we're ready to help. Purchase $25, $50, $75 worth of Gift Cards or more. We’ll distribute donations so that all clients on our Wish List receive a gift. All cards must be purchased by Friday, December 14th. We look forward to sharing the spirit of the holidays together!